Childhood, Christmas, and O Holy Night! When it comes to family, friends, and memories, Christmas can be a time of roller coaster emotions. I was fortunate to have a happy childhood. 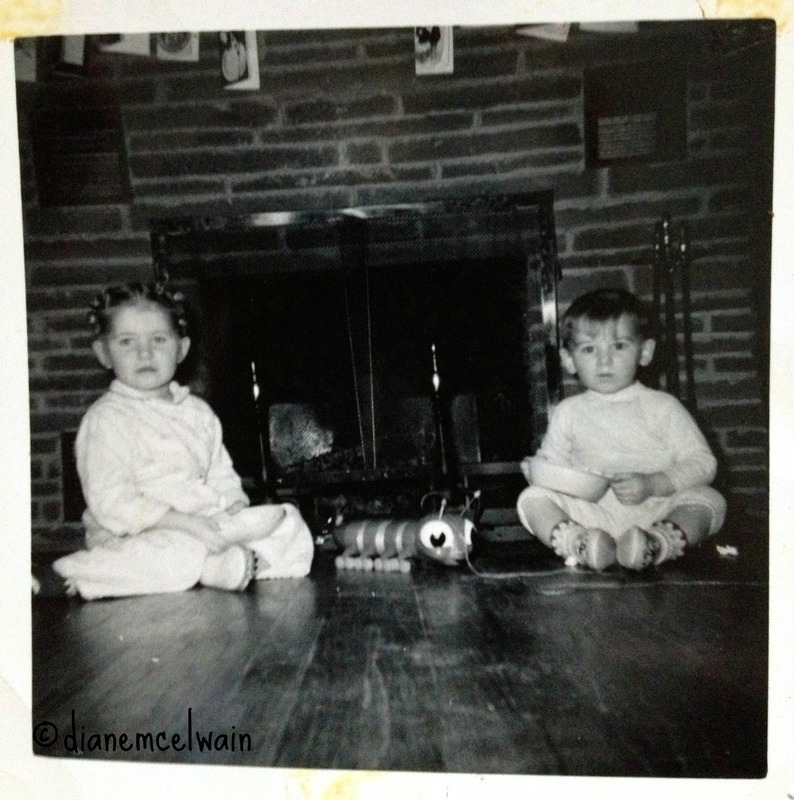 When we were little, no one wanted the latest electronics, but a toboggan, a new dress for school, or a transistor radio. Those were days when we were more content with little. But as years go by and family members slip away, first the great grandparents, then grandparents, and parents, those memories become bittersweet. We recognize that having children and grandchildren of your own, bring new blessings, and joy and there’s the rub. There’s the happy and sad of Christmas. It’s exciting when a child sees anything new for the first time. Eyes are open wide, eager to learn, and eager to try new things. A child knows nothing of failure, but finds dreams and goals most fascinating. A child has so many dreams swirling around in his head that he could fill a million books. And don’t we love to be around children? Wide open excitement: they feel free, and life is a big wide-open space. Last week the Umpire and I went to the Binghamton Philharmonic and heard glorious music, one written three hundred years ago…and all to the Glory of God. The Downtown singing group sang Christmas hymns, and a soloist raised goose bumps with the traditional haunting song: O Holy Night! When my brother and I were very little, I remember a Christmas when my mother brought home a vinyl recording she had made in a studio in Binghamton. 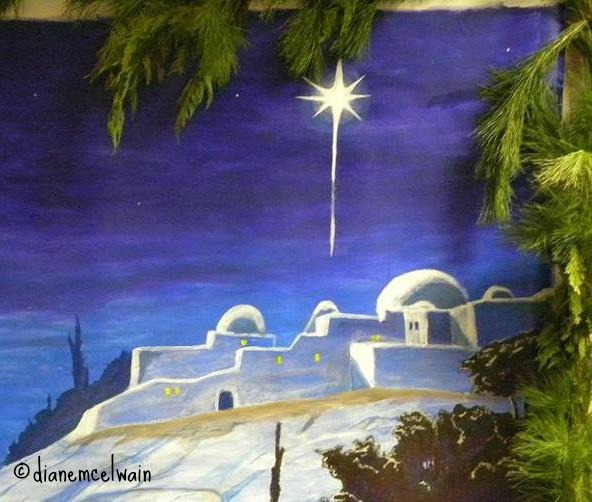 We listened eagerly as we heard her familiar soprano voice sing, O Holy Night. On the other side was a recording of an interview studio director and the soloist, our mother. 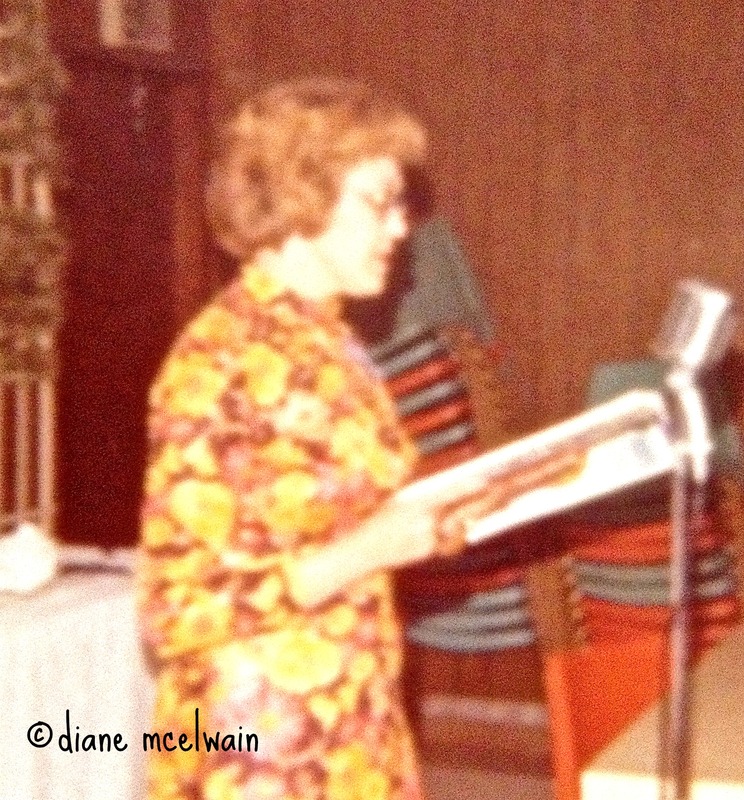 I remember marveling that her voice—our mother was recorded on a vinyl record! In the interview she talked of her family and her two little children. The feeling of child-like awe is still with me. When our mother passed away and we cleared out her apartment, no one found that vinyl that I had seen many times through the years, but it doesn’t take away the memories of that song, or the memories of our mother always singing. She sang as naturally as she breathed. It wasn’t just singing—it was feeling the song into life. That’s the way she sang. At Christmas time, she sang around the house, with or without the radio. She sang in the car as Dad drove us to Christmas with the grandparents. But out of all the Christmas songs she sang, O Holy Night affects me in a most powerful way. I was in Barnes & Noble last week and on a table I saw the return of the vinyl record. There sat a new vinyl of the Beatles. I heard it was coming…the return. As we put up with the new electronics that come our way, we change from the vinyl to tapes, to CDs and return to the vinyl. It’s reliving history. But nothing changes with Christ. That blessed night when Christ gave up his privilege to live in heaven, to come as a child to earth for us, was that holy night. I’m reading Revelation and all will be fulfilled that was planned in the very beginning. Long before earth was created, and man set on earth to be the guardian, God made his plan and has forever set out to accomplish it. The Babe was the center point, the focus, and who witnessed it? A few shepherds were privileged to see the Lamb of God. “Yes, I am coming soon. May you share the news with others and have a blessed Christmas! I’m so sad I never heard that record-or at least I was too young to remember. I DO remember mom singing all the time, though. The was a constant in our lives! Also reading Revelation this month, and Christmas time is a great season for it! Loved this walk down memory lane with you. Merry Christmas! Diane! Oh, your words—your heart—your childhood photos—sooo beautiful! 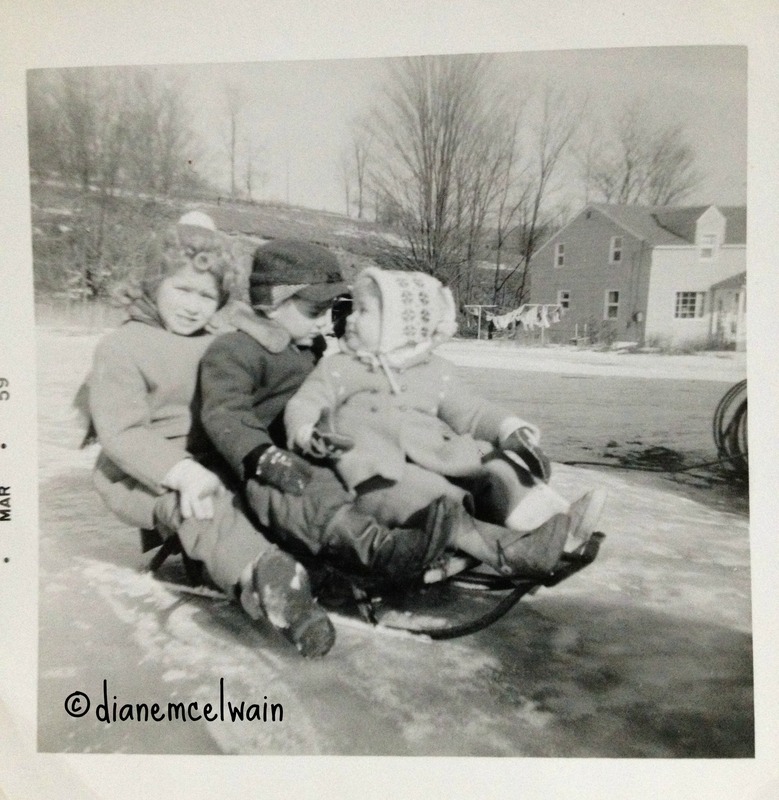 I LOVE the photo of you kids on the sled! I also am reading Revelation this Christmas! I love Revelation—one of my favorite books because it is filled with such HOPE, especially as times grow dark and evil appears to be gaining ground. Our Savior is coming again! Lord of lords and King of Kings! THANK YOU for sharing your gift of words! Oh, I cannot figure out how to leave a comment on your blog page. Help? P.S. Bear with me! Your mailing is coming! Heather, thanks for your encouraging words. Christmas stirs such feelings in people. My happy light came yesterday and I sure hope it works. Hi…happy to be your neighbor at Holly’s today. Christmas is a great time to reflect on all the best parts of joy and happiness and like you, I’m so blessed that while everything around us seems to be moving at ever increasing speeds, Christ never changes. Blessings to you! Thank you Tiffany. As I get older, I find myself pacing myself. It’s great when you start learning to slow down and avoid stress! Thanks for reading. I’m just a little behind on my emails. Anyway, I finally had a chance to read this blog of yours today. 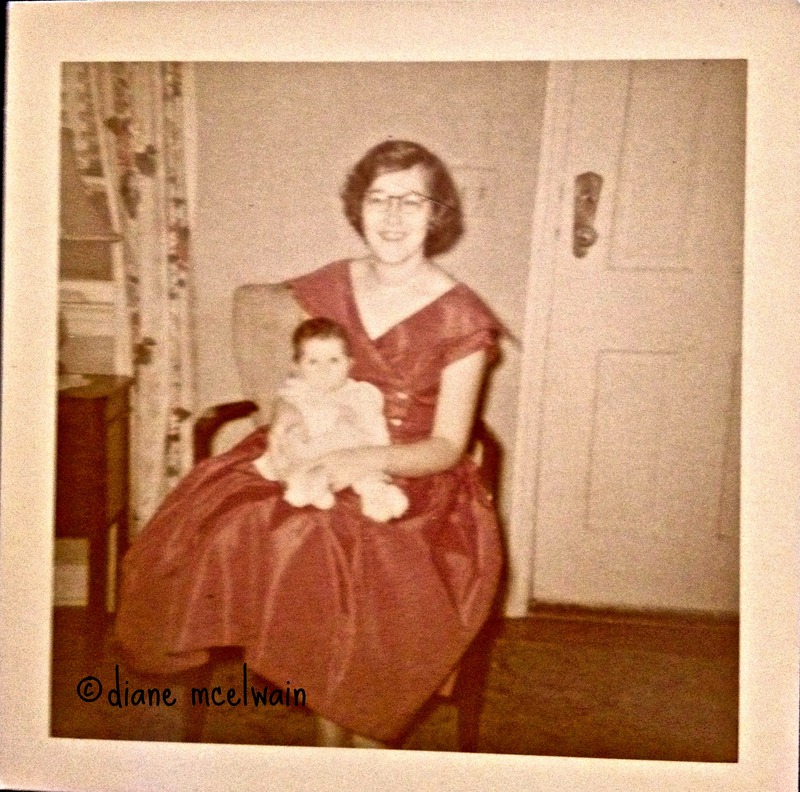 Oh, how wonderful to see the pictures of your mom taken some time ago! She sure was a special lady! I don’t remember her singing at First Baptist of Newark Valley, unfortunately. That is so neat that she was able to have a record made of her singing. I’m finding more and more that holidays are a time of mixed emotions. We were so very thankful to have our three daughters, their husbands, and our grandchildren together this year after having our youngest and her family on the mission field in Madagascar for the past 2-1/2 years! It was SO special to have everyone together again! Thanks for sharing your feelings and memories in this blog! I love the way you call Sherm ‘the umpire’!! I totally understand how nice it is to all be together, its special. Have a blessed new year!